Extrema Ratio is proud to present the Culter Venatorius that, so as not to contradict the current address is a technical knife, practical, perhaps a bit 'specialized and that gives a nod to tradition and to the tastes of the most traditionalist hunters who like to do everything yourself. "I am the hunting knife, I am the claw beak and fang of my master. My job is as old as the flesh and blood. ", We find that describes significantly the pure essence of the instrument. We feel to say that if a tool could be capable of humor probably would have added: "It 'a dirty job ... but someone has to do it ...". The Culter Venatorius, more than a knife, is a complete equipment for slaughtering and skinning of medium and medium-large sized prey, suitable for ungulate hunters. The kit includes: a knife to slaughter and general use, one skinner provided with cross handle to skin and clean the internal organs the animal, a carver to skin head and snout and a stone with two grains for regrinding of all instruments. These accessories are contained in the sleeve pocket leather fat-crafted. The sheath while maintaining the traditional lines, is completely reversible (both the pocket that the passer can be disassembled and applied on the other face of the sheath) and to secure the side which holds the knife has the ambidextrous release. The sheath is handmade by a master saddler leather first-aged choice. And 'possible to bring the sheath is vertical to the belt connected to the leg, which in a comfortable horizontal position, the shoulder or stopped at the waist with a long belt kit with buckle and snap hooks. The handle in cocobolo oiled is long enough to allow the use of the knife as a little machete or chopper and thin enough to allow precision cuts. The blade is in the classic Bohler N690, an excellent steel chrome molybdenum vanadium and cobalt which deserved to become a standard in technical and professional cutlery. The Culter Venatorius is dedicated to all those who wish an Extrema Ratio as batting partner. Commissioned and officially adopted in 2002 by the famous 9th Regiment. Raiders "Col Moschin", this model expresses the quintessence of pure combat knife. Inspired by daggers with asymmetric blade and straight handle but oriented Arditi, from which the Regiment traces its vestiges, it was reworked in a modern way. The center of gravity is strong backlog, particularly the tip piercing. And 'light, handy and intuitive. Each new intruder receives one, and each new intruder is trained to use it. All knives of this series have straight handles KRATON from ergonomic design whose shape and size favors besides a solid grip the rapid change of straight handle (Sabre Grip) to upside (Reverse Grip). An Allen screw stainless steel allows the campaign from disassembly for maintenance and lubrication of the through shank increasing the operational life of the knife. The sheath and 'suitable all'aviolancio and underwater operations and amphibious and is' applicable to the belt or the accoutrements. Kiku Matsuda is one of the most famous artists and scholars sharpening throughout Japan; probably in your collection is already a fruit knife of his passion: collaborates for several years with SOG, William Henry, Pro-Tech and Randall Kings developing to their bevels, and politure sharpening the blades. Inoxpran - Stainless steel Creamer Dolcevita 6 cups Triple bottom for induction. Stainless steel 18-10. 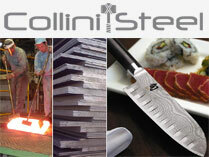 These knives are a perfect combination between tradition and quality construction. Extracted from sandalwood aroma captures the essence of the Orient, stimulates the endocrine system by fostering creativity and intuition. It is a woody fragrance, rich and full bodied scent lingering. Olfactory stimuli of sandal are able to relieve the tension of the body helping to combat depression and apathy. cut-throat razor German Dovo, Solingen historic company, specialized in the manufacture of cutting tools of high and very high quality. Kornkraft - The hand grain mill - Farina For thousands of years the cereals and cereal products have among the most valuable foods for humans. The grain cereal contains almost all substances nutritional and dietary important for human consumption. All Kornkraft products are lovingly created with great care. Therefore, they are solid and durable, even in the kitchen everyday. The Grain Mill are highly reliable and resistant over time. Guaranteed grinds five years. When selecting the grinding grains suitable for you there you can be guided by three criteria: • surrender • the outward appearance • the price The grain mill 'Flour' manual has the advantage of grinding grains gently and without draw power. To obtain 300 g of flour, We must grind for approximately 10-12 minutes. So for larger quantities need to focus on electric grinders. Measures. 340mm height. 140mm width. Knife Traditional Chilean army combat, CORVO origins are mysterious, probably arrived in the New World alongside the Spanish Conquistadors who, in turn, had "appreciated" in the war against the Moors. Undoubted affinity with Jambiya, traditional Arab knife still typical accessory menswear Yemeni. The CORVO, the protagonist of the Pacific War, was realized in many variants the most common of which are the "Corvo Curvo" with a blade that folds almost 90°, version to which we were inspired by the "Corvo Aracameño", longest but with gentle curvature of the blade, which favors more flexibility of use. The innovative miniature greenhouse with its integrated ventilation provides the perfect climatic conditions to cultivate fresh sprouts for salads etc. in your own kitchen. for sprouting seeds, such as alfalfa, mung beans, radishes, chickpeas, wheat, lentils etc. glass dome provides the best lighting conditions ventilation integrated into the base fresh sprouts for salads etc. after just one week H 18.4 cm / 7.2 in, dia. 12.8 cm / 5 in glass / silicone / ABS plastic / high-quality stainless steel Fresh sprouts are rich in minerals and highly fibrous and are therefore healthy ingredients for salads and also for wok dishes. The sprouting jar can be used for cultivating fresh sprouts at any time from the seeds of alfalfa, radishes or mung beans, for example. Swing the seeds briefly in water in the glass dome, allow them to drip into the strainer, which is integrated in the stand, put the glass dome onto the stand and place the sprouting jar in a warm place. Repeat this procedure again and again – and the crispy ingredients will be ready to harvest after one week!